A few months ago I wrote about the American women who were "invisible computers" who worked as programmers on the ENIAC computer during World War II. They weren't alone. At Bletchley Park in England a massive computing effort was underway to decode German messages, including those encrypted using the German Enigma machine. After the war was over, most of the equipment was destroyed and the work done at Bletchley Park remained a secret until the 1970s. Not too surprisingly the role women played in the code-breaking operations is not very well known. To help improve awareness of their role in history the British Computer Society on the women of Bletchley Park. The women - members of the Women's Royal Naval Service and known as "WRNs" or "Wrens" - signed up for duty without having any idea of what they would actually be doing or where they would be doing it. Unlike the women who worked on ENIAC few women who worked at Bletchley Park had formal training in mathematics. Instead they operated the computers that labored to decrypt intercepted German messages. Few of the thousands of women were directly involved in the design or maintenance of the decoding machines, such as the Bombe and Colossus. Their efforts were invaluable listening, recording, transcribing onto tape and operating the vast machines that tried to crack the Enigma code. They were certainly pioneering as the first 'computer' operators. When they signed up for duty, they had no idea that they would be operating computers - Bombes and later Colossus - that ran 24 hours a day under "hot smelly conditions". Their work was unique in the the war effort. What is particularly significant about the women at Bletchley Park and its outstations was that they were recruited as the first machine operators and did not replace men, as was the usual procedure in other types of war work. The first batch of WRNS were despatched as an experiment, although it was doubted at the time if they would be able to do the work. However, the women demonstrated clearly that they could operate the machines efficiently and they proved their worth in the war effort. After the war was over in Europe, many of the women were transfered to Columbo in what is now Sri Lanka to help decode Japanese messages. Few pursued a career, and none apparently continued computer-related work. They couldn't even speak of their wartime experiences for nearly 35 years. Fortunately, their important contributions have now been recognized. Listen to an episode of the BBC Radio 4 program iPM on "Women in Computing from Colossus to the Present", with interviews with Dr. Jan Peters of the BCS "talking about the lives of the women at Bletchley", and Dr. Sue Black of the University of Westminster and BCSWomen on "the current situation of women in the computer business." See photos from the BCSWomen trip to Bletchley Park on May 8, 2008. Their tour guide was a former Bletchly Park Wren. Read interviews with former Bletchley Park WRNs. BBC's WW2 People's War archive of World War II reminiscences has a number from women who worked at Bletchley Park. Check out the stories of Connie Snow, Jean Sealey, Anne Sylvia Pulley, Lois and Felicity Foster Carter - just a few from a search of their archive. Watch video about Bletchley Park from "the one show" on BBC One. Neil Oliver meets two of the original code-breakers at Bletchley Park, Oliver and Sheila Lawn, who met there and went on to marry after the war. Secrecy was so drilled into them that they didn't talk to each other about their work for 35 years! Marion Hill has used the transcripts of some 200 interviews and memoirs from among the thousands of people who worked at Station X to give a remarkable insight into the daily lives of the civilian and service personnel who contributed to the breaking of the Enigma and other Axis codes. She explores their recruitment and training, their first impressions on arrival at Bletchley Park ('BP'), their working conditions, (including the in house food and entertainment), and their time off in billets and beyond. These BP workers, from boffins and debs to ex-bank clerks and engineers, were united in the need to 'keep mum' - even with their family and close friends. However, the stressful burden of secrecy created divisions within the organisation, and illnesses; and many felt disappointed at the lack of acknowledgement for a vital job about which they were forbidden to speak until many years later. 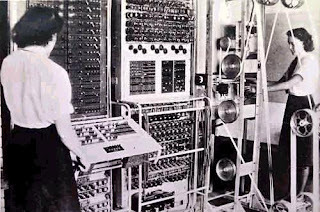 Image: Women operating the Colossus Mark II, which was first installed at Bletchley Park in June 1944.
i'm waiting 4 U 2 comment on it!! What a great blog. I work at a nuclear physics lab (I am not a scientist myself but a science-enabler), and it is so discouraging that in other nations they have so many more NP Ph.D candidates that we do in the US.